I kept the setting simple because I just wanted to see how it would work - I may try again and make something more elaborate. I do like to have something to fiddle with and eggs have such a pleasing shape and texture - I'm loving having one around my neck to play with while I'm mulling something over! 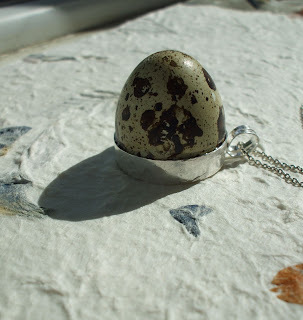 In unrelated news, Barbara has written a post about her favourite pieces from this month's Love My Art Jewelry Boot Camp.....and I got a mention! Thanks Barbara!! 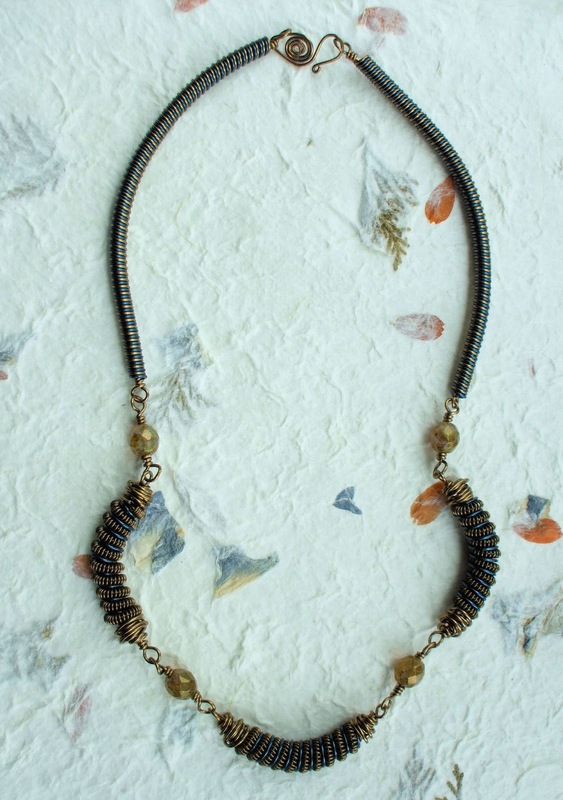 I was experimenting with coiling different colours of copper wire together and came up with the links at the bottom which I really liked - they have an almost ancient Egyptian feel to them (for me anyway) so I made the rest of the necklace to fit in with that theme. It is mostly all wire, with a few Czech Glass beads thrown into the mix. Please go and have a look at what other people have made for this boot camp - I'm always amazed at the creativity shown in these challenges. Thanks to folks from the Love my Art Jewelry blog for organising this fun challenge.